I'm currently suffering from Reader's Block. I have 3 books I've started reading and stalled on, and a pending pile about a mile high. I want to read, I'm just struggling to motivate myself to spend my precious spare time reading. So when Miss RBit from Legally Alien told me that she's doing some reading challenges this year my ears pricked up. 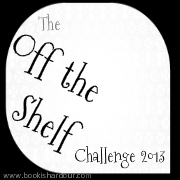 I decided to join her on one: the Off The Shelf 2013 challenge from Bookish Ardour. The goal of this challenge is to read books that have been lurking sadly, forgotten and unread, on your bookshelf for too long. I have quite a lot of those, because I'm a book collector. I buy books I've heard are good and then forget to read them. I buy second-hand books by the boxful. And there's also quite a lot of books that were bought for Dave that I eventually decide I want to read, too. One Flew Over the Cuckoo's Nest by Ken Kesey - another one of those must-read books that I'm yet to read! And there we go. This list in no way reflects my usual reading tastes, by the way - I tend to stick to "safe" warm-fuzzy fantasy and keep clear of what I think of as "Oprah Book Club" books - contemporary fiction or chick-lit. I also used to have a complete blanket ban on sci-fi that I've been gradually lifting a teeny bit at a time. I do read quite a lot of non-fiction but not as much as represented here, and usually don't read biographies. So I'm using the challenge to also push my boundaries a little bit more. All in all that's 45 books in total to get through this year which is probably pushing it so I'll have to see how I go. It's certainly doable and I used to read a lot more than that, so hopefully this will help me get into my reading groove. I've put all the books I have in physical copy on their own shelf in my bedroom, and grouped all the ones I have on my Kindle together, so everything is set to go! I just have to avoid starting too many at once. I expect I'll usually have at least 2 going - a fiction and a non-fiction - but I'll try to limit myself to that. I'll be reviewing and rating on Goodreads as I go also - I haven't used it before (surprisingly) so this is a good way to start. But let's not get ahead of ourselves! I still have to complete my preliminary preparations...so excuse me, I'm off to bury my nose in Dark Matter.